Remote codes for Pyle soundbars. If you have a Pyle Soundbar and want to control it with a universal remote control, Cable remote, or SAT remote, we have the remote codes that will make it work. You can use the instructions below to setup your Pyle sound bar to work with DISH, ATT U-Verse, and DIRECTV remote controls. A Pyle soundbar can be controlled with any universal remote control if you have the correct programming guide and the specific remote codes for the soundbar. 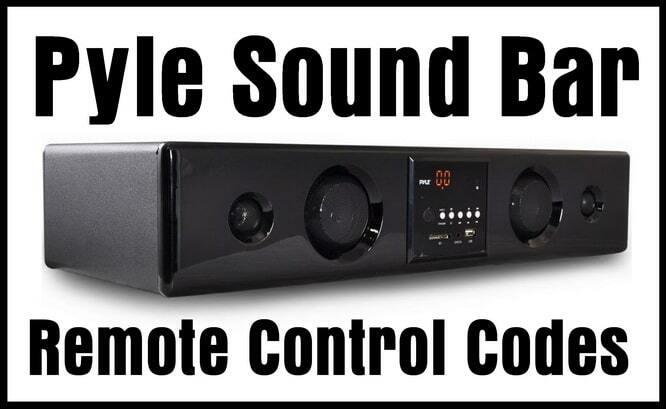 Program your universal remote control to a Pyle Soundbar. Use the following 3, 4, and 5 digit remote codes. – When the volume changes, press SELECT to lock in code. – Turn on your Pyle Soundbar to be programmed. – Type in the remote code listed above using the number buttons. – Use the remote to operate your Denon soundbar. – Try another code and repeat if the code you entered was not correct. The above CODE SEARCH (Remote Control Programming) methods are written for Comcast and DIRECTV remotes but can be used and tried with ANY universal remote. The code search methods above are examples of how to get your current remote to control your Pyle soundbar. Your Pyle soundbar should be able to be programmed to use the same IR code your TV does. Read the manual for your Pyle soundbar. These codes should work with Pyle soundbar models PSBV200BT, PSBVWF300B, and PSBV600BT. Need more help programming your Universal or CAB SAT remote to your Pyle soundbar? Please leave your questions below and we will be happy to assist. I have a psbv800 sound bar. I have a bose remote for my bose unit. May I control my sound bar using any of these?